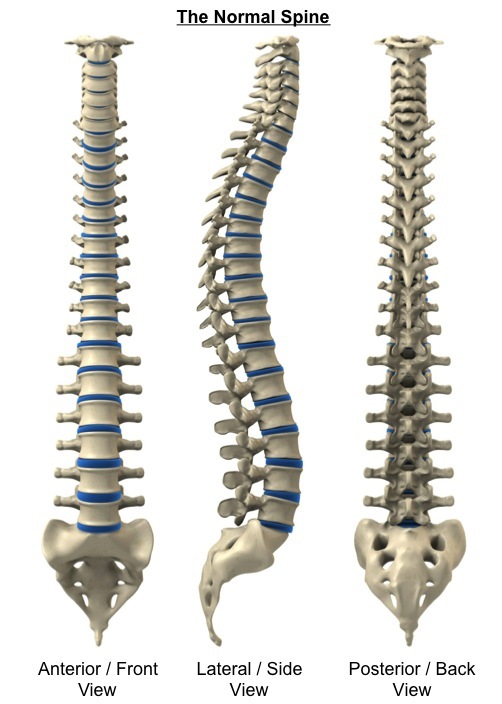 The human spine is made up of five sections. 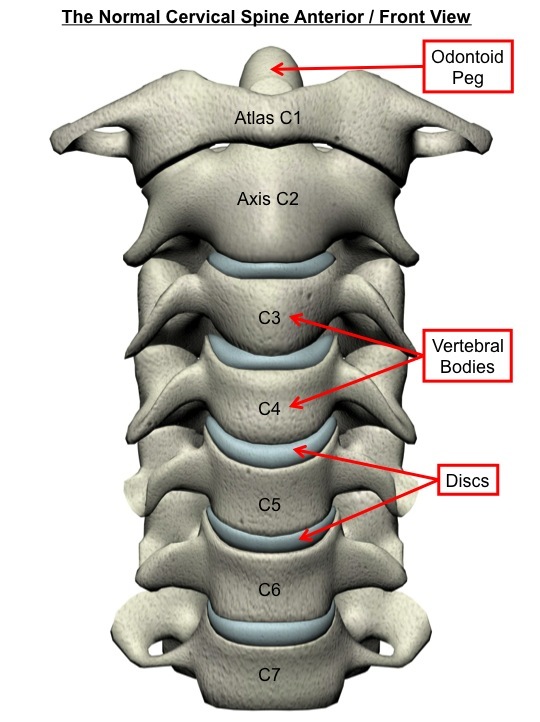 The seven cervical vertebrae make up the neck, the twelve thoracic vertebrae comprise the chest section and have ribs attached and the five lumbar vertebrae make up the low back section between the chest and pelvis. The sacrum is caged within the bones of the pelvis and the coccyx is the lowest segment of the spine. The spine has a normal cervical and lumbar lordosis and a thoracic kyphosis. The spine acts to hold the body upright, permit movement and protect the spinal cord and nerves. 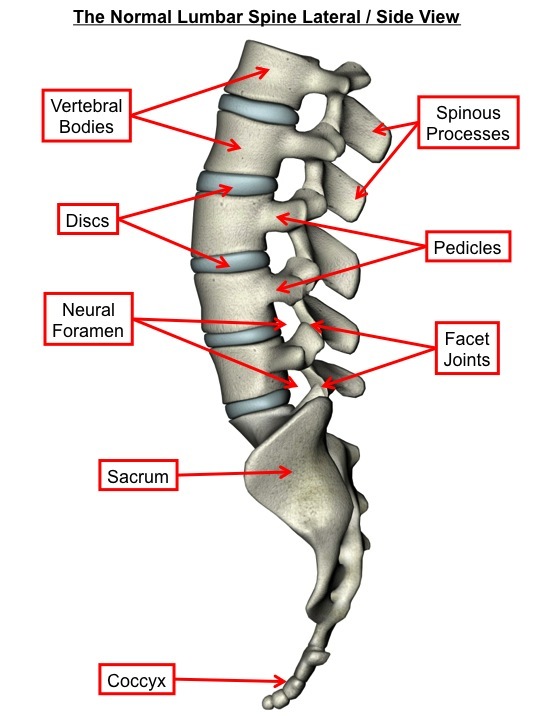 The bones of the spine have similar features but with subtle variations which reflect regional function. 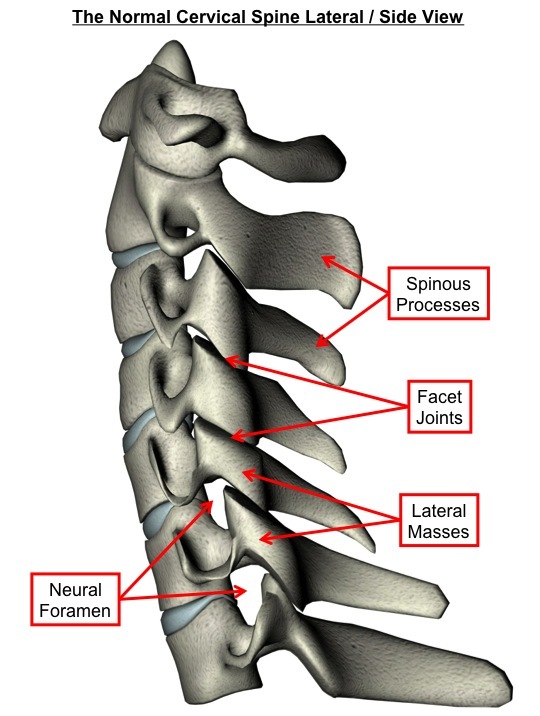 In general, each vertebra consists of an anterior vertebral body and a posterior neural arch. 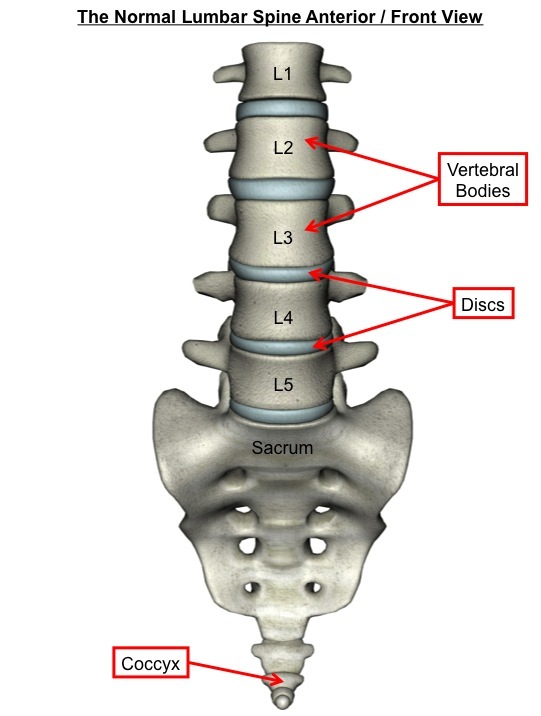 Each vertebra articulates with the adjacent one through the anterior intervertebral disc and the two posterior facet joints. Each intervertebral disc is composed of a central gelatinous material (the nucleus pulposus) and an outer fibrous ring (the annulus fibrosus). 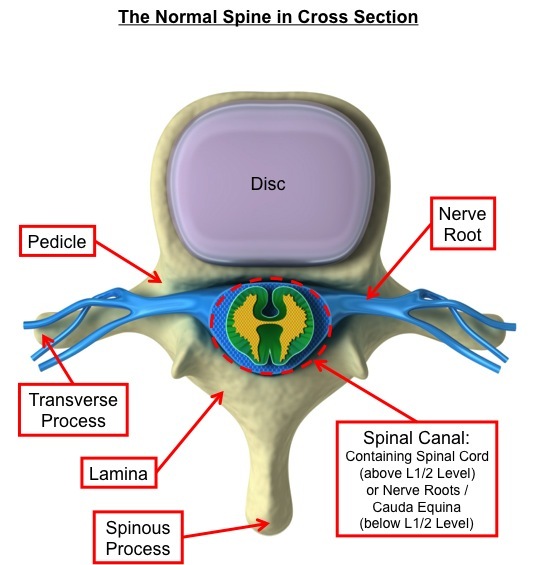 The intervertebral discs can be thought of as pads that permit cushioning and movement between the bones of the spine. The facet joints are synovial joints like many other joints found in the body. The posterior neural arch, through which the spinal cord and nerves pass in the spinal canal, is made up of the pedicles and laminae. The transverse and spinous processes project from the neural arch and attach to muscles and ligaments. 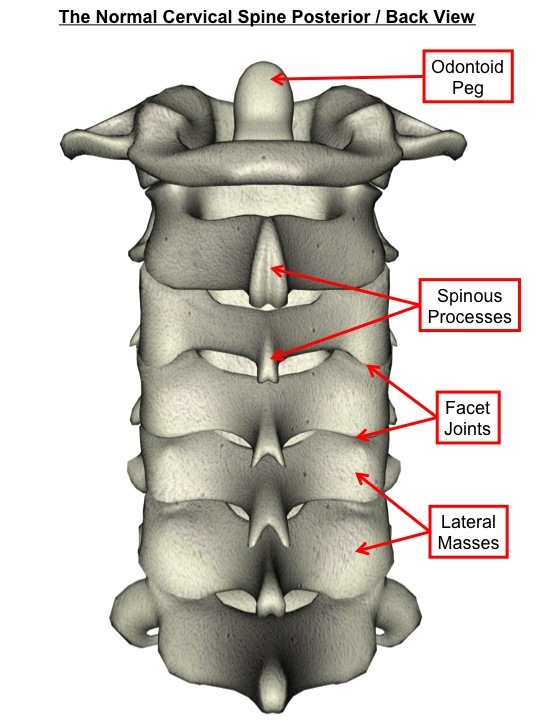 The spinous processes are the bony projections that you feel on your back. The spinal canal contains the spinal cord and nerves. The spinal nerves exit the spinal canal through the neural foramens. 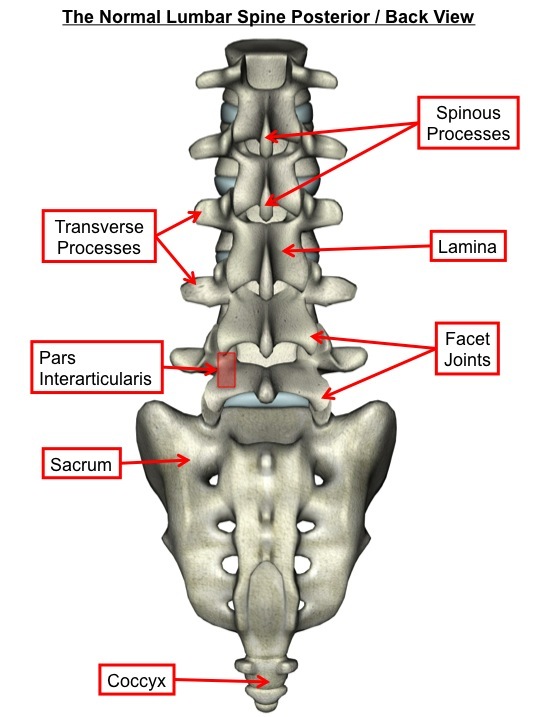 The pars interarticularis describes the posterior bony bridge linking the superior and inferior facets of a vertebra. The following diagrams are for illustrative purposes only and have been simplified.